Last week I tweeted that I found the best caramels in the world. Now I know that “best” and other superlatives can be highly subjective. 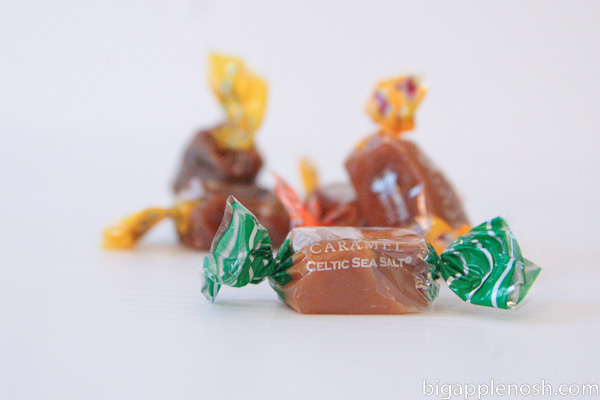 But I literally have never tasted better caramels than Béquet Confections‘ Celtic Sea Salt caramels. While these caramels are not sold in the big NYC, you can order them online. Who knows, I might cave and order – this city gal needs her caramel fix from Big Sky Country! PS – this post is NOT sponsored. I just LOVE these caramels and wanted to tell you about them 🙂 These are definitely my new favorite caramel! Have you heard of Béquet Caramels before? NoshGirl Chef Challenge #3: Last Day to Vote! I adore caramels, my favorite candy and ice cream topping. Ever. love caramels! I can taste the buttery goodness right now. i'm definitely going to try those. Anything with caramel and sea salt is divine, but these look especially delicious! I'm delurking to add that I ADORE these caramels! I followed you over from weddingbee and, ironically enough, live in Montana (Missoula, to be exact) where Bequet is very accessible — I would be more than happy to send some your way 🙂 I love your blog, by the way! Ooh, sea salt caramels sound so delicious. Too bad this post went up today, because my sister-in-law just got back on Friday from a trip to Montana — argh! A coworker recently gave me homemade salted caramels and they were melt in my mouth fantastic. I'll look up these caramels because I am too lazy to make my own! PS: I tried your asparagus recipe! They were DELISH! Oh Wowza. I love a good caramel. I must have one now!! I've never ever heard of these, but they sound like heaven in a wrapper. I *love* caramels – these look delicious! Yum. Mmm, this is good! Caramel with Celtic sea salt! Bequet celtic sea salt carmaels are sold in two locations in nyc ive been to. This is so awesome! Thank you, Katie, for the tips! Tremendous things here. I’m very happy to see your article. Thanks so much and I am looking forward to contact you. Will you kindly drop me a mail? Looks like no cracks allowed according to the VA States police webpage. Link is below. 12. â€“ INSPECT WINDSHIELD AND OTHER GLASS FOR:Approved type safety glass.Cloudiness, distortion or other obstruction to vision.Cracked, scratched or broken glass.Stickers. ALL UNAUTHORIZED STICKERS MUST BE REMOVED.Sunshading material attached to the windshield to ensure it does not extend more than 3 inches downward from the top of windshield, unless authorized by Medical Waiver Ce.cfiitaterOperation of left front door glass.